This north of England four-piece were proficient song writers and their first two singles had been co-written by the group. They had originally called themslves the 'Lionel Morton Four' but adopted their new name before beginning their recording career. Their first release just scraped into the chart, but they hoped for better luck with their second, 'Tell Me Girl' which was penned by Wilsh and Fryer. However it was the proposed 'B' side 'Juliet', which Lionel Morton also shares credit for, that proved of such interest to record buyers that they took it to #1. The group went on to have a reasonably successful chart career, failing to reach the chart with only three of the seven singles they then made before Buck left the group. Two more singles were issued under the abbreviated line-up of 'Fritz, Mike And Mo', but the group then split. Morton had a brief attempt to start a solo career, but when this failed he decided to move his career into production. 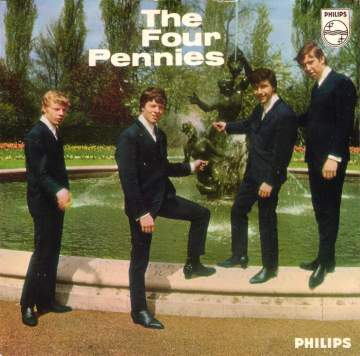 Philips made sure that The Four Pennies were well represented on EPs with no less than four being issued during 1964. The one shown on the right (BE12561) was the first to appear and contained a mixture of material- not just a re-iteration of their chart hits like so many debut EPs. Philips BE12561 1964 "The Four Pennies"
Philips BE12570 1964 "The Swinging Side Of The Four Pennies"
Philips BE12571 1964 "The Smooth Side Of The Four Pennies"